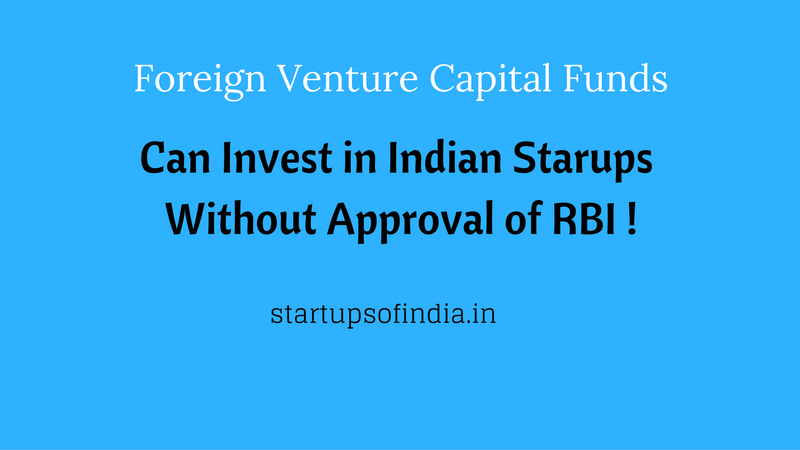 Foreign Investment Norms for Startups Relaxed ! Foreign Venture Capital Funds (FVCF ) registered with SEBI are now allowed to invest in Indian startups without RBI approval. This is a new step by government to make available easy foreign money to Indian startups. So , now FVCF can subscribe equity or equity linked instrument or debt instrument issued by an Indian ‘startup’ irrespective of the sector in which the startup is engaged. Attention of Authorised Dealers Category – I (AD Category - I) banks is invited to the Foreign Exchange Management (Transfer or Issue of Security by a Person Resident Outside India) Regulations, 2000, notified vide Notification No. FEMA 20/2000-RB dated May 3, 2000, as amended from time to time (Principal Regulations). 2. Investment in India by Foreign Venture Capital Investors (FVCI), registered with SEBI, is governed by the provisions of Schedule 6 of the Principal Regulations. In order to further liberalise and rationalise the investment regime for FVCIs and to give a fillip to foreign investment in the startups, the extant regulatory provisions have been reviewed, in consultation with the Government of India and accordingly amendments have been carried out in Schedule 6 of Foreign Exchange Management (Transfer or Issue of security by a person resident outside India) Regulations, 2000, through Foreign Exchange Management (Transfer or Issue of Security by a Person Resident outside India) (Third Amendment) Regulations, 2016.
x) Infrastructure sector (This will include activities included within the scope of the definition of infrastructure under the External Commercial Borrowing guidelines / policies notified under the extant FEMA Regulations as amended from time to time). b) Equity or equity linked instrument or debt instrument issued by an Indian ‘startup’ irrespective of the sector in which the startup is engaged. A startup will mean an entity (private limited company or a registered partnership firm or a limited liability partnership) incorporated or registered in India not prior to five years, with an annual turnover not exceeding INR 25 Crores in any preceding financial year, working towards innovation, development, deployment or commercialization of new products, processes or services driven by technology or intellectual property and satisfying certain conditions given in the Regulations. c) Units of a Venture Capital Fund (VCF) or of a Category I Alternative Investment Fund (Cat-I AIF) (registered under the SEBI (AIF) Regulations, 2012) or units of a Scheme or of a fund set up by a VCF or by a Cat-I AIF. 4. It is clarified that downstream investments by a Venture Capital Fund (VCF) or a Cat-I AIF, which has received investment from FVCI, shall have to comply with the provisions for downstream investment as laid down in Schedule 11 of the Principal Regulations. a) FVCI may open a foreign currency account and/or a rupee account with a designated branch of an Authorised Dealer for the purpose of making transactions only and exclusively under this Schedule. b) The consideration for all investment by an FVCI shall be paid out of inward remittance from abroad through normal banking channels or out of sale / maturity proceeds of or income generated from investment already made as per paragraph 3 above. c) There will be no restriction on transfer of any security/instrument held by the FVCI to any person resident in or outside India. reporting requirements, as hitherto, shall continue. 7. AD Category – I banks may bring the contents of this circular to the notice of their constituents and customers concerned. 8. Reserve Bank has since amended the Principal Regulations accordingly through the Foreign Exchange Management (Transfer or Issue of Security by a Person Resident outside India) (Third Amendment) Regulations, 2016 which have been notified vide Notification No. FEMA 363/2016-RB dated April 28, 2016, vide G.S.R. No.465(E) dated April 28, 2016. 9. The directions contained in this circular have been issued under section 10(4) and 11(1) of the Foreign Exchange Management Act, 1999 (42 of 1999) and are without prejudice to permissions / approvals, if any, required under any other law. © Copyright 2015 Startup India Stand Up India. Designed by Bloggertheme9 | Distributed By Gooyaabi Templates. Powered by Blogger.